Offered by the United States Mint as a continuation of a series dating back to 1986 is the 2013 American Eagle Silver Proof Coin. Each of these are struck from one ounce of .999 fine silver and feature a diameter of 40.60 mm. Along with these numismatic proof versions, the US Mint also debuted bullion Silver Eagles in 1986. Both varieties feature the same basic designs and specifications aside from their finish, their intended buyer and the inclusion of a mintmark. The bullion coins are struck for investors and sold through the Mint's network of authorized purchasers for a small premium above the spot price of the ounce of silver in each. These proof coins, however, are struck for collectors and sold directly to the public by the United States Mint for a price which includes a more significant mark-up over any melt value associated with it. In addition, the proof coins contain the mintmark indicating which US Mint facility produced it. 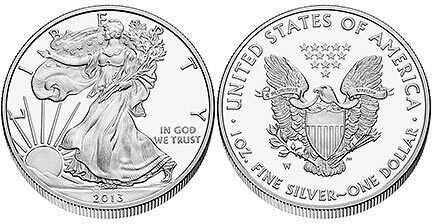 Proof Silver Eagles have been struck annually since their debut with the exception of 2009. That year saw intense demand for the bullion version forcing the US Mint to cancel the numismatic release. Shown on the obverse of each coin is a depiction of Adolph A. Weinman's "Walking Liberty." This design first appeared on the 1916-1947 half dollar coin and is considered one of the most beautiful ever struck on an American coin. Obverse inscriptions include LIBERTY, IN GOD WE TRUST and the year of production. US Mint engraver John Mercanti designed the reverse image of the coin which shows a heraldic eagle with shield. Reverse inscriptions include E PLURIBUS UNUM, UNITED STATES OF AMERICA, 1 OZ FINE SILVER and ONE DOLLAR.